Carretera N-340, Km. 165, 29680 Malaga, Spanje. 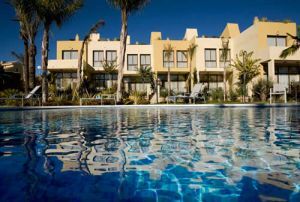 Hotel Selenza Estepona Thalasso & Spa is a new 4-star superior hotel located along Costa del Sol's new Golden Mile between Marbella and Estepona, a short walk from the beach and surrounded by top golf courses. As well as being a hotel it also has an impressive Thalassotherapy centre fitted out with 2 sea water pools, a fitness centre, 3 hammams, hydro-massage baths, mud wraps etc. There are also many services and facilities including a garden area with 2 outdoor pools 1 adults and 1 childrens, 2 restaurants, a coffee shop and a piano bar.